Triethyl phosphate TEP use - ZhangJia Gang YaRui Chemical Co., Ltd.
(1) catalyst: catalyst of xylene isomers; polymerization catalyst of olefin; catalyst for lead tetraethyl; catalyst for carbodiimide; substitution reaction catalyst of trialkyl boron and olefin; the catalyst that manufacture ketene by acetic acid with high temperature dehydration; catalyst for polymerizing the styrene with the conjugated diene compound; if used in the polymerization of terephthalic acid and ethanediol ethylene, it can prevent fiber discoloration. 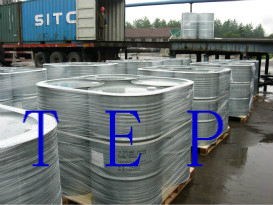 (2) Solvent: solvent of cellulose acetate and cellulose acetate; solvent for maintaining the catalyst life of organic peroxide; solvent for dispersing the ethylene fluoride; peroxide agent and thinner for the curing catalyst of polyester resin, epoxy resin. (3) Stabilizer: chlorine-based insecticides and stabilizer; phenolic resin stabilizer; solid agent for sugar alcohol resin. (4) For polyester resin: curing agent for xylenol formaldehyde resin; softener of bakelite that used in shell mold; vinyl chloride softener; plasticizer for vinyl acetate polymer; flame retardant of polyester resin. These are the usage of triethyl phosphate, and if you want to learn more information, please contact us! If The usages of triethyl phosphate product is not what you want, we can be customized according to your needs, please send us your order to Email: sales@yaruichem.com , or click here to post your buying lead.